The key benefit of heat pump technology is that it requires much less electricity or natural gas to heat and cool a building. Another benefit is that heat pump technology is scalable. 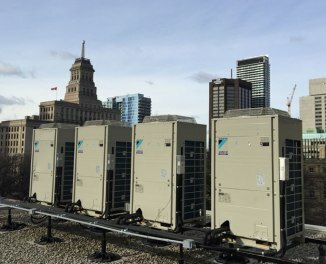 Heat pumps can be used in a single room apartment, or for large industrial-commercial-institutional (ICI) facilities, or anything in between. Variable refrigerant flow (VRF) air-source heat pumps (ASHPs) are an important heat pump technology that is available, but underdeployed, in the ICI sector. VRF ASHPs transfer heat between outdoor and indoor fan coils via small-diameter refrigerant piping and can also be used to transfer heat between different zones of a building, providing simultaneous heating and cooling with minimal energy input. Toronto and Region Conservation Authority’s (TRCA) Black Creek Pioneer Village Visitor Centre is a 50,000 square foot ICI building in North York. Its HVAC system, currently powered with both electricity and natural gas, is due for replacement and the site has been identified to have significant conservation potential. A VRF ASHP system was selected for the site based on variety of factors, including the business case, energy/carbon reductions, ease of retrofit, occupant comfort and physical space savings. The retrofit is scheduled to commence in Spring 2018. Using funding from the Atmospheric Fund (TAF) and TRCA’s corporate sustainability team, STEP is leveraging this opportunity to fully document the retrofit process and perform detailed measurement and verification so as to develop a case study aimed at helping other building owners potentially interested in adopting the technology. This is the third project, in a series of four, co-funded by TAF.